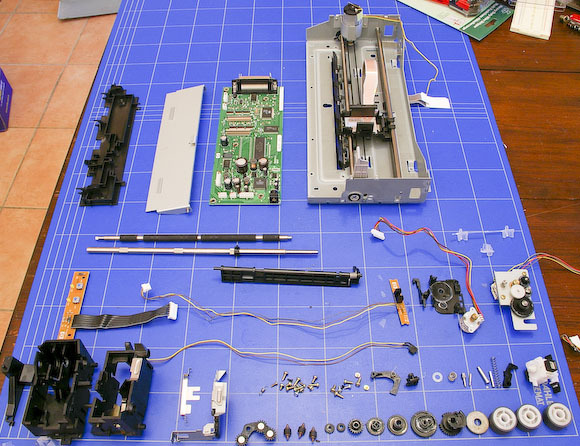 Nobody will mind if you pull an old Inkjet printer apart. Every house has at least one in a cupboard somewhere, kept because it cost good money back in the day, but now replaced by all in one devices which cost less than their own replacement ink cartridges. My household had 6 mothballed inkjets. Now there’s only 5, and my parts box is filled with cool bits and pieces. 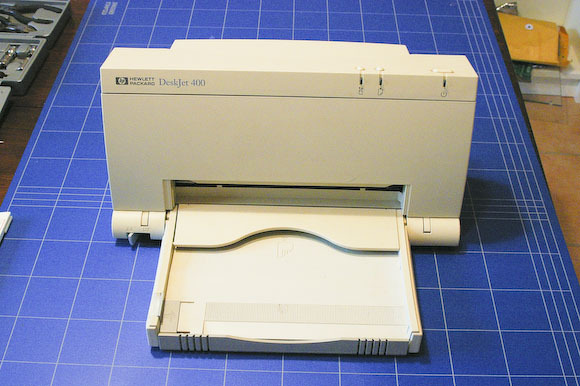 I’m not sure about the more recent generation of do-everything photo printing devices, but older inkjets are built to last, and to be servicable rather than thrown away when they stop working. So it’s possible to get inside and take everything apart without having to break components or remove rubber feet and search for screws hidden beneath stickers. These devices have evolved over time and are compact marvels of mechanical and electronics engineering. As you puzzle your way inside you get to marvel at the designers’ ingenuity. 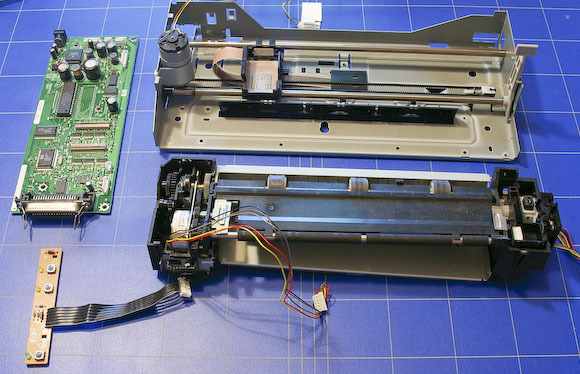 As the case comes you can already see some great physical computing goodies: A stepping motor, gears, axles and cogs. The circuitboard sits on the back of this model. 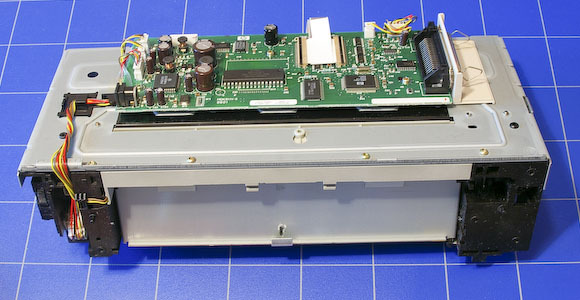 I haven’t taken the time to look up the components here, but there’s plenty of useful componentry. 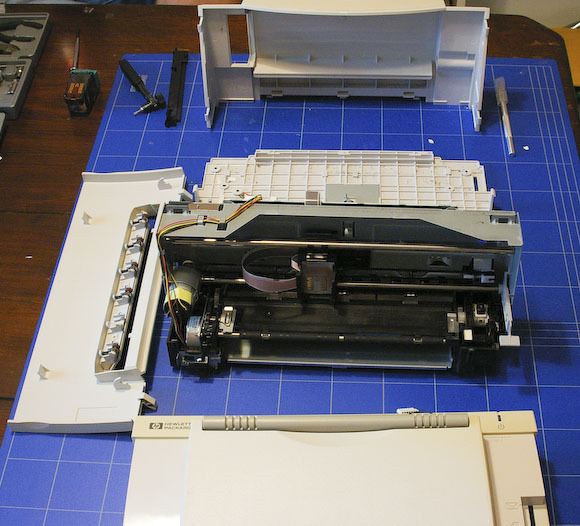 Next step: I have a couple of Processing + Arduino projects which have been waiting for stepping motors, and there are plenty more old printers in the house. 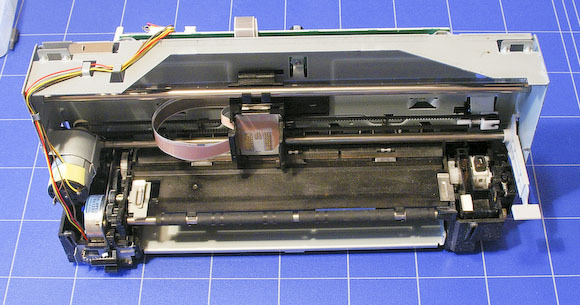 I’d love to see a Maker Challenge, tasking teams to create something new using only the components found within an inkjet printer.